Finding the perfect oyster was impossible – until now. After a decade of careful cultivation, the perfect oyster was created. Introducing Kusshi Oysters. Describing perfection in an oyster was the easy part. The meat had to be consistently plump, firm, fresh, and delicious. The cup had to be remarkably deep and consistently sized, and the shell would be smooth, non-brittle and easy to open. The size should provide the perfect portion for one, exquisite bite. We then set out on a journey to fulfill this vision. Through years of study and design, we have developed a proprietary process that brings our version of it to life. Kusshi Oysters are shellfish creatures of many elements with a direct reflection of its unique habitat. Grown on Stellar Bay’s cutting edge oyster farm in Deep Bay, British Columbia, Kusshis are raised in nutrient-rich Pacific Ocean waters, tumbled to strengthen the shell and give it its distinct, smooth appearance. This tumbling process achieves the desired deep, easy to open cup that holds within it the perfectly consistent, plump, firm, and delicious bites of oyster. 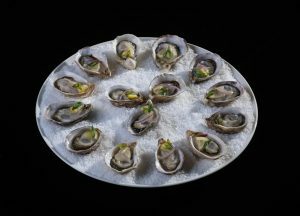 Loved by foodies and raved upon by chefs, the Kusshi oyster pairs magnificently in many recipes, leading to a versatile pacific oyster fit for any occasion. These masterfully crafted oysters are quickly becoming a favourite around North America. Popular in restaurants along the West Coast, including Vancouver, the word of Kusshi Oysters is spreading across Canada and into the USA. Restaurants in major markets, including Washington DC, San Francisco, Chicago, New York, Las Vegas, Miami, Toronto, and Montreal, have picked up Kusshi Oysters to feature in their menus.